The Mariner Scout Ship TRADEWIND, Girl Scouts of San Francisco Bay Area Troop #2609, is based at the Redwood City Marina, Redwood City, California.. Our purpose is to enable girl Mariners ranging from the 8th grade to high school seniors to participate in all facets of team building, leadership, and fun adventures involved in boating and sailing. We maintain our boat ourselves with plenty of scrubbing, swabbing, and polishing. 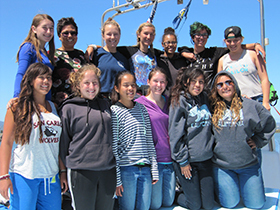 The TRADEWIND is a pre-eminent Mariner Girl Scouts Program in California. We provide an accepting environment for young women to develop leadership, teamwork, values, and self-worth. Through community service, problem solving, and applying skills both on our vessel and in our lives, we have fun, learn, and form friendships while we achieve our goals in a welcoming setting.